Happy Friday, friends - so glad the week is over! I received the cutest custom sized dress from eShakti a few days ago, but unless a lovely warm front passes through, I don't foresee it making a blog debut soon. I did instagram it here and wanted to let you know you can receive 20% off your order with code: THEDPPERBN. Have a fantastic weekend - oh, and Happy March, too! You look warm and fabulous! 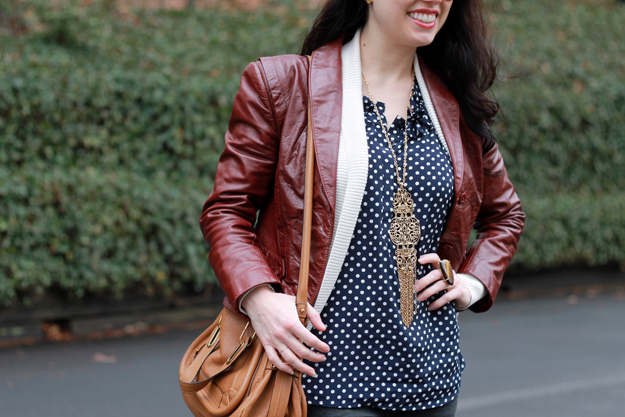 One can never go wrong with dots or leather, so having them both together seems perfect!! Loving this layered look!! Have a great weekend love! Love that leather jacket, and I seriously love that necklace. I can't wait to see a full outfit post on your new dress! You look so comfortable, warm AND chic! A super hard combination to pull off so well and you are rocking this!